As perhaps the greatest book owning generation of all time begins to downsize, age, and pass away, real estate transactions force a decision on what to do about ALL THOSE BOOKS! My first experience with the real estate issue and book collecting was when my Aunt passed away and my Uncle was tasked with clearing her apartment. They thrived over a committed 30+ year relationship, in modern parlance, as life partners, without the need of a legal marriage contract. They lived two blocks apart in separate residences to retain their independence and sanity. While her passing was not a surprise, Uncle was in deep mourning and not really thinking about all that needed to be done. After the memorial service I stayed in Chicago to help with the apartment, the contents of which were my Uncle's to dispose of. His idea of disposal was simply to give it all away, he really didn't need more books, furniture, rugs, or art. I volunteered to go through the books, pick out the first editions, collectible and association copies and box the rest for donation to a local library. My first attempt to inventory a life time collection of books from a devoted reader and longtime member of the Chicago literary and advertising community was accomplished in about 8 hours. The result was that I saved from the donation bin first editions of Fitzgerald, Hemingway and signed/inscribed books by Truman Capote and Studs Terkel. The books reside at my Mother's home and someday, they will live in my library. My interest was to preserve the memory of my Aunt through her books and almost 20 years later, I remain convinced that was a well spent 8 hour project. Today the transfer of assets and collections of all sorts from the "baby boomer" generation to the younger, and primarily digital, generation is beginning to ramp up. From scholars who have amassed full libraries of research materials, professionals (architects, artists, designers, authors, lawyers. Doctors, scientists ....)to life-long readers who enjoyed the modern first editions so valued by collectors today, when they were originally released, a vast treasure trove of books will be changing ownership. It is my full belief that 99% of these transfers will be completed behind a veil of ignorance so pervasive that many will simply donate valuable collections to the closest book donation bin without ever bothering to find out what they have and potentially what they are worth. While I am 99% certain that stocks, bonds, real estate holdings, and obvious collections of coins, stamps, and art, will survive the transfer, books are simply too many and too varied to expect that anyone will take the time and expend the effort to determine what has actual monetary value is (let alone, value as a cherished family memory worthy of transfer to future generations). Today's mild rant and serious warning was motivated by a fascinating and nauseating Wall Street Journal slideshow in the January 10, 2011 Real Estate section, entitled, "A Literary Duplex." The title and accompanying image caught my attention and I immediately began viewing the slideshow, reading the captions and becoming depressed. The basics of the offering from Sotheby's International are simply amazing, a 5000 ft. duplex on West 67th Street, New York, New York, with a reduced price of $6.9 million. The pitch line for the slide show and the WSJ coverage immediately motivated me to read on, "The owners of this four-bedroom Hotel de Artistes duplex on the Upper West side are ready to sell their collection of 3,000 books to the buyer of their home." Surprisingly, my initial reaction was, who would give away a book collection at this price and what was in that library? Reading on I became depressed. No, this is not a private library of carefully collected books amassed over a lifetime of collecting, rather the books were included in the previous sale of the property in 2007. 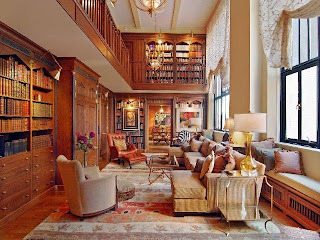 The slide caption for the library image was, "The double-height living area which holds most of their library was kept intact. 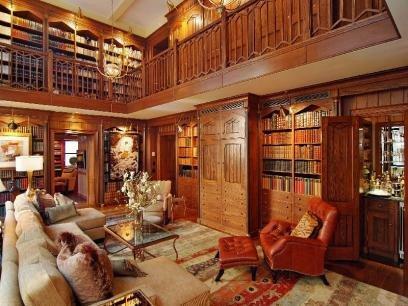 They purchased the collection of some 3,000 books from the previous owners. 'I just knew I couldn't fill the bookshelves,' said Mr. Noris of the library, which consists of first editions, signed copies and classics like Shakespeare." Further along in they slide-show, the owners suggest that they "....would consider selling a substantial portion of the book collection." I am left to assume that the current owners acquired the books when they first purchased the property for $7 million plus in 2007 and will sell most of the books to the next owners as a separate transaction. Granting the benefit of doubt, at least they know the books have some value! Something must be done about this, not the suspect facts written in the captions, but the reality that this, potentially wonderful and valuable library, is being passed around among the wealthy who just need to "fill the shelves." 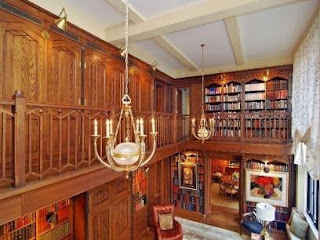 Further research on the Sotheby's website listing for this amazing property provides no further insight but again features the library. My opportunity is obvious. I need to connect with the owners and/or the real estate agent and sell them on hiring me to catalog and establish a real value for this collection. I wonder what first edition wonders there are to discover, and Shakespeare, a first folio collection perhaps! It was not easy sharing the images so I'm sharing them all, hope I don't get into trouble! You need any real estate. Please visit realtybargain.net . Here you get more famous real estate. Those estate is your mind. Our all estate is your choice. There square measure variety of kinds of on-line stream nfl games soccer games. Some soccer vice package applications simulate the precise match conditions and player characteristics and permit the users to represent an entire team. Florida is moderate, coupled by circumstances going from recreational assorted qualities to social offerings. The city offers various openings for work, quality medicinal services, moderate average cost for basic items and a charming climate. These elements have all additional up to make Tallahassee Florida one of the best places to settle, in the United States. Fewer New York homes for sale have been taking place across Rockaways in Queens and in Brooklyn. Thanks a lot for sharing your experience! In my view, house values are being increased rapidly. Much thanks to you for imparting to us,I too dependably gain some new useful knowledge from your post. I say increase the marketing and the sellers will Call. Not only that but if you are canvassing the world (or at least your area) that you buy problem real estate holdings, eventually you will be acknowledged for what you do and sellers will telephone you strictly on your reputation. this is what is called cost effective marketing. With our monetary system at a local absolutely is, I am choosing to make information on filing for jobless bonuses. This inspiration were to illustrate how our jobless machine works, what is the fixed will be taking and rejecting professes, immediately after which add books within my own engagement ring information in what the supreme maneuvers in addition very common goof ups are typically submitting redundancy elements. Thanx for sharing this blog ...its really nice for my business Homegather.com. it helped me a lot whatever you have provided. I really appreciate your way of presentation about real estate and private library in Australia. Thanks a lot for sharing this post. If you wants to know more about real estate. Gordon Rutty can help you. This is informative share! thanks! The vast majority is bought and sold through real estate agents.thegreatestatesale.com (We use an "intermediary" and an "agent" to refer to the same specialist). Closeouts here are extremely fascinating and the individuals who are keen on land business space ought to never miss them. You can take in a great deal on such occasions.